Scroll down and read my diatribe about those who push the start line and, lo and behold, what pops up today but a YouTube on a Race Committee dealing with a rambunctious Finn fleet. Race 3 start of the Finn Europeans courtesy of the TheFinnChannel . This video captures the difficulty of identifying those over the line ..... from the video soundtrack ... Right now the boat that is the problem .... I can't tell! Looks like they got them away on the second start. 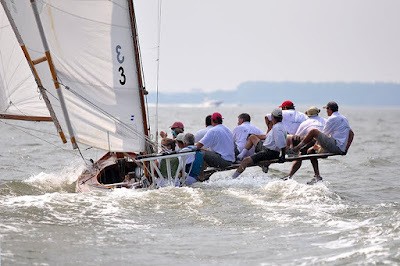 Bob Patterson and the Chestertown Yacht and CC had the Classic Moths back this past weekend. We got seven Mothboats (I like to call our class the Circle M class because I'm tired of explaining.... no...no we don't foil like the International Moth... we're not that kind of Moth class... glassy stare... not comprehending... why wouldn't everybody want to foil? Sigh!!!!). Wind was a lightish westerly with a strong weather shore component but enough right shifts to keep it interesting. Mike Parsons won again and the Nationals are up next. With Jeff Linton not competing (Lightning Worlds conflict), Mike is riding a strong season...maybe this year? Mike almost beat Jeff two years ago but got passed on the last run of the last race. While derigging on the grass, a Dan on a bike stopped by (my varnished Classic Moth... ahem... Circle Mboat seems to attract passerbys). Dan is just starting a stint on the Tall Ship Sultana , based out of Chestertown. Dan is from that subset of sailors (seemingly 180 from dinghy sailors), true seamen who handle tall ships with square sails and hemp line the size of your biceps. Surprisingly he was genuinely interested in my 11 foot dinghy and then admitted his father had built a 16 foot, strip planked replica of a Brigantine. We talked of his aspirations of moving up through the Tall Ship ranks (Sultana being one of the dinky ones) and the possibility of meeting up again on Sultana's next trip to Annapolis and then off Dan rode. A 16' replica of a Brigantine seemed worthy of Internet investigation... Let's go to YouTube. Sure enough, there is a YouTube of what I assume is Dan's fathers Brigantine Replica. Looks like there could be some stability issues. Somewhat roly-poly. I usually have some pictures of Classic Moths sailing the regatta but no cameras at this event. From my archives, 2005 Chestertown rigging. 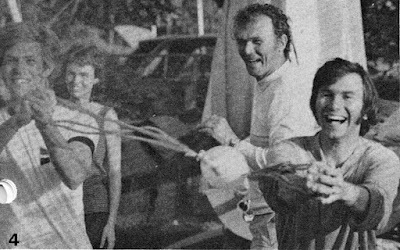 Bob Halsey, open canoe racer/sailor passed away about three weeks ago at the age of 93. Bob is one of two iron men Canoe sailors I came to know when I showed up in the International Canoe class in the early 1980's. Bob and Steve Lysak were already well into their 60's but had the strength and endurance of someone in their 40's. 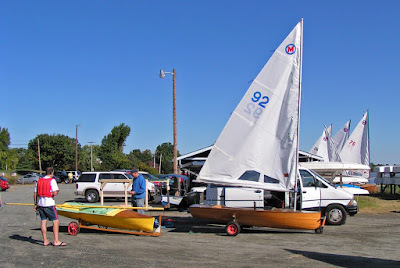 Bob would race the Open Canoe sailing events at Sugar Island, turn around at the end of the regatta, load the canoe with camping gear and go on a sailabout of the Canadian Park islands for a couple of days. Bob was still swimming the Round Sugar race (over 2 miles in length) well into his 80's and when he went South to Florida, he would do the Rudder Club's Mug Race on the St. Johns River (the Worlds longest river race). 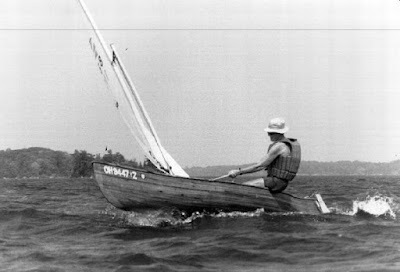 A well sailed Laser usually takes 12 hours to complete the race, most time Bob and his open Canoe were on the water for 14 hours, finishing well after dark. Bob started his last Mug Race two years ago (he didn't finish that one, though he had previously won the slow handicap division with his open Canoe). Bob had been a metal worker out of North East Ohio and he had that low key Midwestern, take it in, measure it, and then parse out a cryptic but insightful... this is how it needs to be done.... from someone who had been creating, and fixing stuff for his entire life. Bob, in his own words on his sailabout of the Thousand Islands. Probably the greatest photo of Open Sailing Canoe Racing, Bob Halsey in his self designed and built sailing Canoe with the ACA rig, at Sugar Island. Photo by Chuck Sutherland. This has got to be the wildest singlehanded photo I've ever seen. For the spray to be blown flat like that, the wind gust has to be over 30. Looks like the poor skipper is a second away from having his tiny yacht driven under. Update: Anonymous has identified the location......"Member of the Avon Sailing Club, sailing on the river Severn." 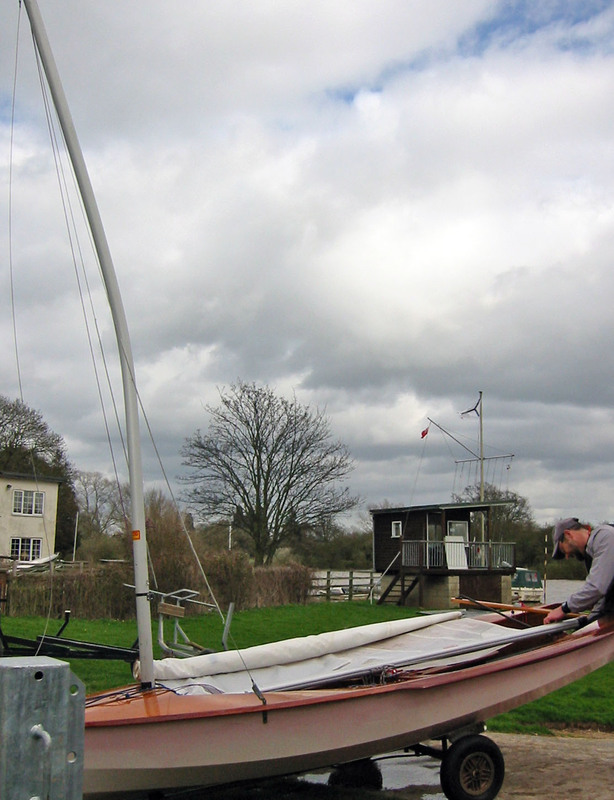 The Solo is another popular singlehander class in England (among a plethora of singlehanded classes in England). Designed by the great Jack Holt in the mid 1950's, the Solo is around 12.5 feet long (3.8 meters) and a hull weight of around 150 lbs. I think I lifted the photo from the Solo website. If anyone has the photographer's name, I would like acknowledge him/her. 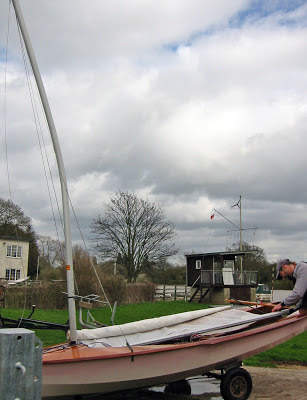 I've done a more recent post (December 2011) about the Solo Dinghy over here. 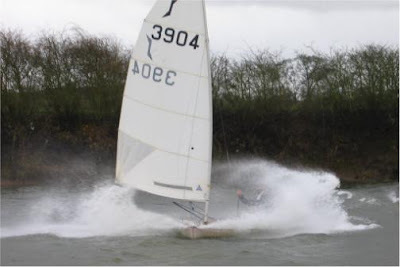 Update: Oct 2012 - David Harris from Avon SC sends along a post mortem photo of Solo sailor and boat. Seems the mast complained somewhat about being sent out in these conditions.